This was the 2nd visit to East Brighton Park this Season and the weather was quite different from the full sun we got at the end of September. 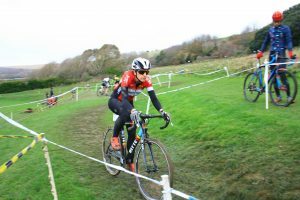 The all-day rain in Brighton on Saturday threatened to make this predominantly grassy course a muddy affair but with no rain overnight or on the morning, the stiff wind that was blowing helped dry the course out nicely. In fact, choosing tyres and pressures was crucial, for the early races it was certainly intermediate to mud tyres and towards the later races the course was well defined and dry and could be raced on dry condition tyres. The course began with a short sprint to a pair of tight opposite turns, leading into a short straight with a high speed corner into a 180 followed by another fast corner extending down to the furthest part of the course. There it turned to enter a straight into a nasty headwind, taking the full length of the playing field, before turn back again for a fairly straight run down to a very short, but very steep bank. Here it turned about 135 degrees to take in the lower terrace alongside the playing fields – a nasty draggy straight with subtle ascent, before dropping back down toward a 90 degree bend into the finish straight. 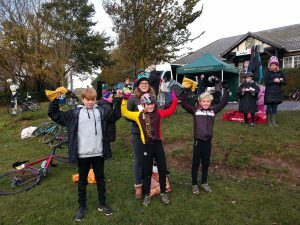 U10s were lined up in the now traditional fashion and their ever caring soigneurs (aka parents) stood ready to receive their jackets, zip-offs, and anything else the mini-racers had to shed before the riders launched into the first tight s-bends. Noah Smith (Team Darenth) and Joe Carpenter (Sutton Cycling Club / C&N Cycles), were followed closely by Woody Clayton and Oliver Goodman (both Rotor Racing). 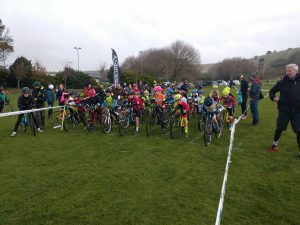 The u10s/u12s had their own mini version of ‘the wall” – Techniques were varied – from the ‘hit it hard and fast’ approach of the lead riders, to early the dismount , whilst in between were those not quite committed or nervous enough to do either, which more often ended with a rapid ascent followed by an equally rapid descent keeping the marshal very busy before they got back to their feet for a short but tricky run. As the race continued, the lead pair maintained station, Noah and Joe finishing in their consistent 1st and 2nd place respectively. 3rd place had an interesting battle as one of the new faces Fraser Macarthur (HUP / Team Milton Keynes) came through the field to take third place just ahead of regulars Oliver Goodman and Woody Clayton. The lead girl, Orla Willis (Panagua CC) followed in very closely on the wheel of Woody with just a couple of second separating them at the end. The girl’s podium was completed with the outrageous ViCiOUS Velo skinsuit of Peggy Knox followed by Charlie Anastasia Furlong (Limited Edition). With gridding swiftly completed by the commissaires (Phil and Jon) the riders quickly got ready for the race ahead – the start line scarily intense as they wait for the whistle and parents equally intense on the sidelines. The usual suspects took to the front with Oscar (Team Darenth) leading Peter (Sutton Cycling Club / C&N Cycles) into the first corner. Playing the undercut game on the second corner, Peter then took the lead on, setting a pace to take the pair a few seconds clear of the field. Missing from the normal mix was Mak Larkin (Rotor Racing) who as left on the sidelines to cheer after a MTB crash last week (get well soon Mak). Meanwhile the new faces of Miles Horner and William Blount (Chapel Tri, and both regulars in Wessex League), and Connor Macarthur (HUP / Team Milton Keynes) had made great initial progress through the field having been gridded toward the back, now up to 3rd, 4th and 6th respectively. 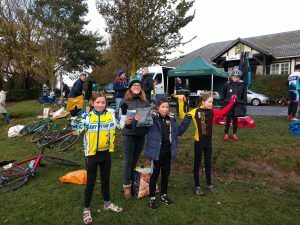 For the girls, there was more business as usual, with Zoe Roche (Sutton Cycling Club / C&N Cycles) leading and eventually winning with a nice margin, followed by a battle between Lola Arnold (Team Darenth) and Molly Jones (Sutton Cycling Club / C&N Cycles). Toward the end of the race Molly made her way through to claim 2nd place, with Lola ending up 3rd on the podium. As the end boys race approched, Oscar stretched his lead to a comfortable cushion and Pete found himself in a battle with Miles Horner (Chapel Tri) with the pair exchanging places throughout the lap for the rest of the race, Pete finally claiming 2nd place. Behind them, Theo Sandell (Southborough and District Wheelers), WIlliam Blount, and Connor Macarthur battled over the next three places. The next close battle to play out was Finlay Goodman (Rotor Racing / Bedgebury Boars) up against Will Flatau (Charlotteville Rascals) with Finlay just ahead in a photo finish! The final closing battle saw a race long fight between Holly Hazell (Team Darenth) and Ciara Bakovic (Sutton Cycling Club / C&N Cycles) with Holly taking it again by a single second. 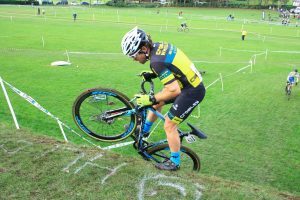 The full size course was tweaked from the last time we came to East Brighton – Much more technical, shorter in length and was great for spectating. 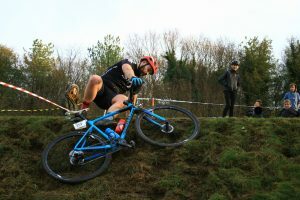 It was clear that this course was going to be all about your technical ability to traverse slippy adverse camber banks up and down and how much confidence you had to go full gas at the big bank and ride it. The big bank was the area that most spectators congregated. A top heckling group o emerged that also managing to get hold of a megaphone! Riders commenting that it was the good-natured heckling U10/U12 kids that helped them get up the bank. Straight away Joe Blackmore (Team Darenth), Sam McGhee (Sutton CC and Jules Reuter (HHYCC) opened a small gap in the rest of the field. After approx. 2 .5 minutes of racing they were all working hard into the long straight into the headwind that then did a 180 degree turn to then start to line up to the big feature on this course, the big Bank. A good crowd were in attendance cheering and chanting to riders to “Ride it, Ride it”, and from his sprinting style it was obvious to all that Sam McGhee was going for it. He rode it with ease, shot down the fast-steep descent and had a 10 second lead. Everyone else behind chose to run. This is where it became all too obvious of the ability levels in this race, with many of the younger rider really struggling – some riders resorting to throwing their bikes up the bank and them clambering after it! The commissaires made a wise choice and pulled this section of the course out of the race much to the surprise of the leaders on their 2nd lap. 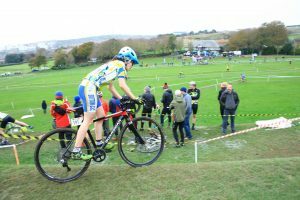 Back to the race and Joe proved very strong, after a 6th place in the national trophy at Ardingly and made light work of the course with very consistent fast lap times to finish almost 2 minutes clear to claim a good win. Sam held 2nd place for most of the race but a last lap mistake allowed newcomer, Lukas Nerurkar (Preston Park Youth CC) to claim 2nd Place. Sam rolled home for the final spot on the podium with Jules Reuter in a consistent 4th place. In 5th place Piers Higginson (Team Darenth) came home 1st Youth under 14 nearly a minute ahead of Clement Reuter (Herne Hill Youth CC) in 2nd place and local rider Luke Goodwill (PPYCC) claiming 3rd place. 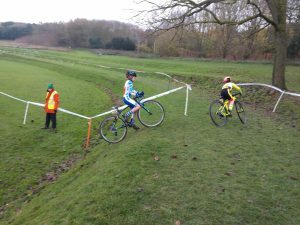 In the under 16 Girls race it was great to see Charlotte McGreevy (LiV AWOL) racing a Cyclo Cross again and Sarah Schonback (HHYCC) coming home in 2nd place but they both had to play 2nd fiddle to the under 14 girls today. Lucy Wollaston (Herne Hill Youth CC) and Aofie Bakovic had a race long battle and finished within 33 seconds of each other. Lucy certainly seemed to cope better with the technical banks to claim a well-deserved win. A great effort from all riders today, that course really tested everyone. The Junior grid was preceded by a presentation for the Challenger Ride of the Day which at Round 5 had been won by Jack Lear (SDW) when he demonstrated amazing skill to bunnyhop his way up a set of horse hurdles that every other rider was running including the Seniors. As the race set off he quickly jumped to the front along with Kamran Amin (VC Jubilee) to drive the pace. The attacking nature of the race set in quickly and Amin proved he had a very big engine, creating a gap of about a minute and then holding on for the win. Behind them Kishan Bakrania, usually on the podium, was having a bad day out and just couldn’t conquer the tricky conditions – he kept good natured about it to claim 4th at the end. After the first lap Adam Churchill (PPYCC) overtook Jack and looked very strong until two laps to go, when Jack seemed to sense a weekness and closed the gap. He applied the pressure for a lap and a half before Churchill finally cracked. 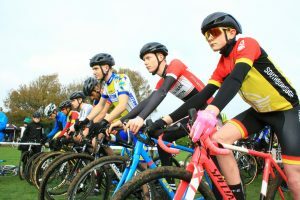 It was impressive racing to watch from all of the Junior riders and it would be fantastic to see a few more riders in the category for them to race. The biggest category of the day saw 70 riders line up on the now cold grey windy grid – once again we caught up on awarding some Challenge tyres – this time to Alex Beyfus and Martin Rowark who stopped their races last time at East Brighton to help injured riders. This was such a great show about just what ‘cross is all about so we thank them for their great work. Andrew Taylor, Ryan Harris and Bill Bell headed the rush to the Wall for the first time – Bell, usually an expert at hills, didn’t fare so well, but quickly recovered from his first lap problems to get back into the race and eventually clain 3rd place in a great race with Harris who grabbed hold of 2nd with some great lap times. Another solid performance by Andy Taylor once again showed the variation in ability in this category – Eventually he managed to lap all riders with the eception of the top 8 which included James Dear, Phillip Deacon, Russel Short, Stuart McGhee and Nick Sturman, the last three of which found themselves in a great last lap battle for 6th which included many overtakes. The women set off and Caroline Reuter (London Phoenix) quickly established herself in the lead. 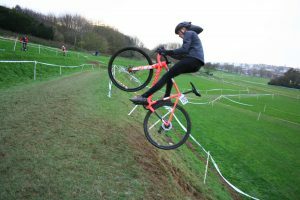 Clearly, she was still carrying good legs from her excellent 3rd place in her first national trophy at Ardingly 2 weeks ago. However, an unusual first lap mistake saw Caroline hit the deck on the short right downhill turn coming back in the main straight approaching the big bank. She quickly picked herself up but had lost all her start effort advantage as Alice Davies (Sutton CC) lead the strung-out field up to her back wheel. The chants “Ride it, ride it!” could be heard from the spectators and Alice Davies did not disappoint, she went full gas. Her style was sort of a high jump Fosbury flop, in that she was able to ride approx. 80% of the bank but the final bit was a sort of fall sideways and then to grab top of the bank. It was unconventional but very effective and helped her to be 1st Junior rider in 4th place in the whole race. A new rider turned up to challenge the regulars this week. On the first lap Phil Boarer (GS Vecchi) showed his intention and led the field up to the big bank and decided he preferred to run. Jez Parson (Brighton Excelsior) had no such worries and zipped up the bank to catch up with Phil. On completion of the first lap we had 6 riders all within 8 seconds of each other. The race then quickly settled into Phil just ahead of Jez and Jon Lyons (GS Invicta -ELO -Herberts Cycles) but with Jez seeming more comfortable with the technical banks to yo yo between Phil and Jon. At one point it looked like Jez was going to make a real fight to the line, but Phil’s strength shone through as he broke the elastic with 3 laps to go to win by 25 seconds. Jon was comfortable in 3rd place a further 24 seconds behind but did have a scare on the big bank on one lap whilst riding it when his front wheel hit one on the foot holds and his whole bike flipped straight up in the air. It looked for a moment a trip to the bottom of the bank was on the cards, but he managed to hold it, dab a foot and carry on. Phew! The Crawley Wheelers had their usual in house team scrap for club honours with George Higgs winning this edition in 4th place, with Stuart Evans 5th, Nick Welsh 7th and Doug Fox in 8th place. Doug required spectator assistance to help extract his bike on lap 7 of 8 whereby he lost 45 seconds and a very good his chance of beating his younger club mates to the line. Fresh from receiving his pair of Challenge tyres from being rider of the day at Herne Hill, Wilf Sinclair (Pearson’s Works) hit the front early and opened a 10 second gap by hitting the technical section without a single mistake on lap one. Wilf even commented later that he was surprised to get a gap so early but was very conscious not to get too carried away and go out too fast. He was looking very good on the first 2 laps. Patrick Hough (Lewes Wanderers) was the rider all were worried about at the start as he won the last race at this venue, but he was looking a little unsure of himself on this more technical course. He first got himself up to Chris Ansell (Corridori) and just before half distance he found his rhythm and had dialled into this course. From there on he caught and then steadily distanced himself from Wilf to claim his 2nd win at this venue. Wilf held onto the 2nd place at 40 seconds from a last few laps surge from Chris who claimed 3rd place. In 4th Wilf teammate Chris Morrison recovered from a disastrous 2nd lap whereby he lost 45 seconds on the leader. His lap times demonstrate that without his mishap a podium position was certainly in reach. In 5th place and continuing to improve each race was Tom Franklin (In gear RT). Special mention and style points go to Liam Yates (5th Floor) for his very impressive jumps and tail whips on the big bank! Last time at East Brighton we were treated to some super close battles after the races fractured into small groups. 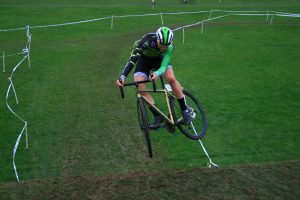 The terraced sports fields and off-camber banks created a classic London League Cyclocross course and thrilled spectators across all categories. The quick dry conditions at round 4 may not be the same when we get to late November so it’ll be great to return to the venue and see how this affects things.